Pre-planning your Kiddush is the best strategy to guarantee that the simcha will encounter a minimum amount of glitches. If the Kiddush is being held in a shul, inquire about their guidelines. Some shuls have their own Kiddush committee; others will allow you to prepare the Kiddush yourself. Even if you cater it yourself, there are many details that are subject to review. For instance, which certifications does the shul permit? Does the shul require that all baked goods be Pas Yisroel and/or Yoshon? Can you purchase boxed bakery goods from the supermarket, or must the baked goods come from a Shomer Shabbos bakery? Does the shul accept baked goods from out-of-town bakeries? Furthermore, cakes are often decorated with pictures or lettering that one may not cut on Shabbos. If rolls are served, is there a washing station? If one purchases rolls marked “Mezonos”, does it meet the criteria of the rav or Rav Hamachshir? And even if it does meet the criteria, does one still have to wash for the seudah?1 If the Kiddush is dairy, do the dairy products have to be Cholov Yisroel or will Cholov Stam products fit the bill? If the Kiddush bakery products have to be Yoshon, the baal simcha should realize that Yoshon does not just include breads, cakes and cookies. Products such as jarred gefilte fish, licorice, pretzels, noodle kugels and even potato kugels that may have flour in their ingredients must also be Yoshon. What is the shul’s policy regarding prepared food that is brought in to the shul from a take-out store? Does the store need to be under hashgacha and, if so, which hashgachos would be acceptable? Another issue to keep in mind is how the food is packaged when it comes into the shul. Meat and fish items require two simanim (seals) when they leave the store; cheese, dairy, and bakery goods require only one siman. Is someone responsible for checking that the items coming into the shul have a reliable kosher hechsher and are properly sealed? Additionally, one should ask about the shul’s policy regarding home baked items; sometimes, there are outstanding home bakers who bake beautiful simcha cakes. Does the shul’s policy require kosher supervision for these cakes? If neighbors are bringing home baked products, some of the guests may expect a few of these goodies to be Yoshon. It would be a good idea to place small signs indicating which items are Yoshon. If potato chips and pretzels are being purchased, do they have to be Bishul Yisroel and/or Pas Yisroel? It goes without saying that someone needs to be responsible for opening all unopened cans, bags, boxes and bottles before Shabbos. Candies are often brought into the shul by the baal simcha. If the Kiddush is fleishig, the candies will need to be pareve; but, if the Kiddush is milchig, should the candies be Cholov Yisroel? What is the shul’s policy concerning wines and liquor? Does all wine need to be Mevushal? Do all the liqueurs have reliable kosher supervision? Everyone loves hot potato kugel and cholent. Since the baal simcha is preoccupied with the event and cannot be in the kitchen, he or she should designate a person to be responsible for igniting all cooking and heating equipment. Since no cooking can take place on Shabbos itself, all food must be fully cooked prior to Shabbos.2 Many halachos were instituted to prevent transgressing Torah prohibitions, including two major ordinances to prevent cooking on Shabbos. “Shehiya” is leaving uncooked food on a cooking surface before Shabbos, in a place where it is possible for the fire to be adjusted in order to hasten or improve the cooking. To prevent this, halacha states that either the food should be edible before Shabbos or that the fire and controls be covered with a blech in order to avoid any potential issues with adjusting the fire. All food should be “fully” cooked before Shabbos.3 In addition, the stovetop should be covered with a blech and the knobs should also be covered over. The second edict enacted to ensure that there is no cooking on Shabbos entails returning cold food to the stove or oven. This prohibition is called “Chazara”.4 There are strict guidelines that must be followed when returning cooked items to the oven. These laws apply even if the stovetop is covered with a blech or the food that one wants to put onto the blech is fully cooked and still hot. It is very important to review the laws of Chazara with your morah d’asra or rav to see what he does or does not permit to avoid any problems of bishul or chazara on Shabbos. As one can clearly see, it is more than the color coordination and table decoration that contributes to a successful Kiddush. Mazel Tov! It’s a boy, and he was born on Friday morning. Everyone is rushing and hurrying to get the shalom zachor ready. Quick! Get the beer and the arbes (chickpeas). Wow! That cherry wheat flavored beer sure looks good! So does that can of chickpeas. Hold on a second. Did you realize that flavored beers need reliable kosher certification? If your guests use only Yoshon products, were you aware that beer (which is produced from malted barley) may be Chodosh after the end of December? With the exception of water and plain seltzer, all beverages require reliable kosher certification. Do not make the mistake of assuming that a flavored alcoholic beverage is just a little lemon juice mixed in the beer; those flavors can also come from Eretz Yisroel. Glycerin is often used as a blending agent in these flavored beverages. Regular beer and ales are generally acceptable; those coming from the Far East, however, should be avoided. As for the chickpeas, these are one of the leading items likely to be generated in a canning facility that also produces canned meat products. Therefore, it is very important to purchase canned chickpeas with a reliable kosher certification. Heimishe hechsharim typically state “Bishul Yisroel” on the label. Sheva Brachos are festive events in the Jewish life cycle, and Shabbos Sheva Brachos can be a grand undertaking. 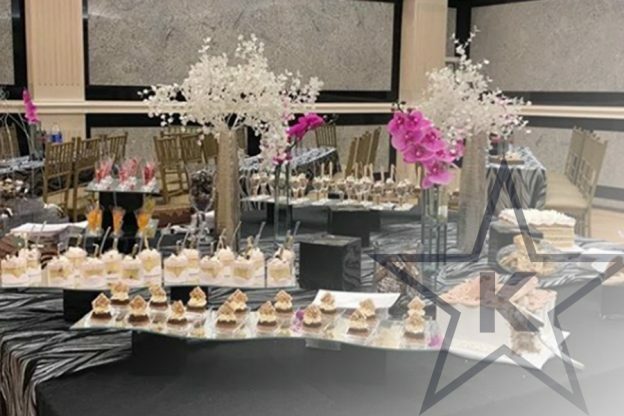 As the cost of having a caterer has become excessive for some baalei simcha, they have opted to cater the event themselves and buy prepared foods from reliably certified food vendors. In the trade, when food is purchased from the caterer or from the take-out store, it is referred to as a food service event as opposed to a fully catered simcha. It is critical that the baal simcha understands what his responsibilities are for this particular Shabbos event. When the caterer delivers the food items, or when the food items are picked up from the store or commissary, it is imperative that the food be properly sealed—especially meat and fish. Once the seals are broken, the hashgacha’s responsibility ends. It is the baal simcha’s responsibility to check all food items as they enter his/her home or social hall to determine if the products have proper kosher identification. The baal simcha must also assure that the kashrus status of the food continues. He is responsible for ensuring that an observant Jew watches the meat, chicken and fish items to avoid problems of “bosor shenisalaim min hoayin”. This problem often arises when non-Jewish help is hired to prepare the meal and are not supervised in the social hall where the event is being prepared. If the meal is being cooked by non-Jewish or non-observant support staff, all fires must be turned on by an observant Jew to avoid problems of bishul akum. It is very important to realize that fires are often turned on and off during the course of the meal preparation. For the halachos of hot food and cholent preparation on Shabbos, please refer back to the “Some Like It Hot” segment in the Kiddush section. It is important to use water urns that do not introduce fresh water, and to have all water urns turned on and tea essence made before Shabbos and kept warm on the blech.5 If sugar is being served in packets, all packets should be opened before Shabbos. All sealed food containers should also be opened before Shabbos. One should also be cautious about salads and vegetables which have to be checked before Shabbos to make sure they are insect-free. Often salads, platters and trifles are made on Shabbos and involve cutting and separating peels, pits and seeds from the fruits or vegetables. Separating these items incorrectly may cause one to violate the prohibition of “Borer”, separating the bad from the good. These laws can become quite complicated in regards to food preparation. Therefore, it is advisable to check with one’s rav to review these halachos. All bakery items should be checked for Pas Yisroel and Yoshon. Wine and liqueur have to be checked for proper hechsharim and, if necessary, the wine or grape juice should be Mevushal. The baal simcha is responsible for his/her chinaware, flatware, utensils, heating equipment and display pieces. Any questions regarding the previous use of these utensils should be addressed prior to their use. Last but not least, the guests should be clearly aware that a simcha being held in a hall or a shul may not be under any official kosher certification. As you can see, a little planning can go a long way to ensure that your simcha will be freilach and geshmack with minimum aggravation. Once you have catered your own simcha, you will have a different appreciation for the words Mazal Tov—you’ve made it through the self-catering experience! Yasher Koach! 5. Kashrus Kurrents, “Kashrus of Tea”, footnotes regarding the use of tea essence on Shabbos, by Rabbi Boruch Beyer, Summer 2013.